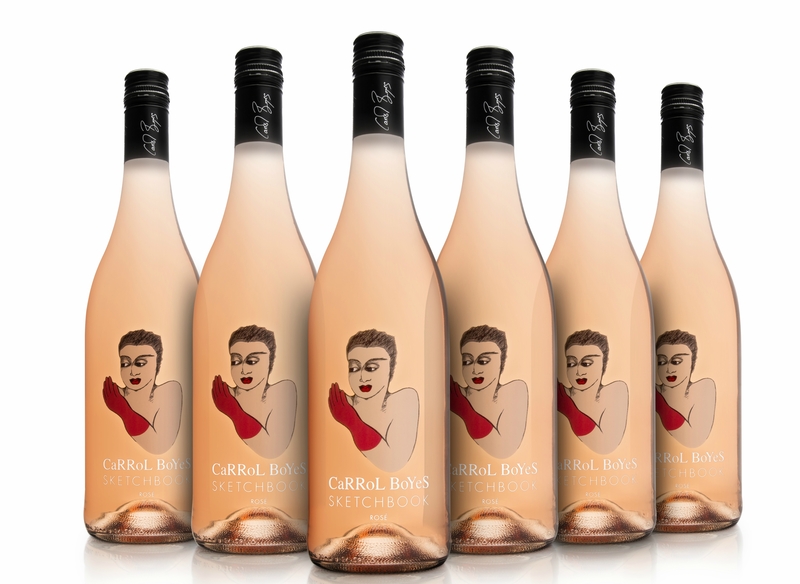 Redolent of tropical flavours, the 2016 Sketchbook Rosé from Carrol Boyes Wines is made using only the finest Cinsaut grapes, and is part of a collection of critically acclaimed, limited-edition vintages. In the making of the 2016 Sketchbook Rosé, grapes grown in the Swartland region are handpicked at 22° Balling. Yield is low in these parts, where the land is dry and the vineyards are unirrigated. Picked grapes are thus of especially good quality. After fermentation, each batch goes through a selection process from which only the best go into the finished rosé. Made from 100% Cinsaut grapes, the 2016 Sketchbook Rosé is a melange of flavours, including cherries, strawberries and raspberries, and hints of apple and apricot. Its fruitiness and mild acidity produce a distinct flavour that caresses and lingers on the palate. This salmon-pink wine can be enjoyed on its own, but goes equally well with sushi. Carrol Boyes, the well-known South African artist and designer, has partnered with her brother, farmer and financer John Boyes and partner Neels Barnardt of Barnardt Boyes, to create a unique range of limited-edition premier wines under the Carrol Boyes Wines banner. The selection is critically acclaimed and won the 2015 Michelangelo Award for Best MCC (awarded to the 2011 Limited Edited Edition Pinot Noir Chardonnay). Each Carrol Boyes Wines vintage comes with a unique label designed by Carrol Boyes herself. The wines are, quite simply, the embodiment of the Carrol Boyes lifestyle. Just as Carrol renders her iconic work into various functional art pieces, Barnardt Boyes creates rich, sumptuous wines out of soil and fair climates. Wine lovers are encouraged not just to try Carrol Boyes Wines, but to share, celebrate and collect each of these limited editions. A marvellous marriage between science and technology led to the creation of this exquisite range, which showcases Barnardt Boyes’s exceptional winemaking skills, and honours a heritage that is almost 350 year old. Hendrik Snyman is Barnardt Boyes’s winemaker in residence. Over the years, Hendrik has gained a plethora of experience, working in South Africa, France and New Zealand, and has won several industry accolades. Vintages from Carrol Boyes Wines are available to purchase online at www.carrolboyeswines.com and at the Carrol Boyes store in Somerset West. For more information visit www.carrolboyeswines.com. Hendrik studied viticulture and oenology at Elsenburg Agricultural Institute in Stellenbosch. He has made wine since he graduated in 2005. He has also worked in France, New Zealand and the United States – countries that are renowned for their winemaking. He joined Barnardt Boyes as a winemaker in 2013. The Fairview Rose Quartz 2016!